The Canadian War Museum has acquired a Victoria Cross awarded to sergeant Herman James Good on 8 August 1918. 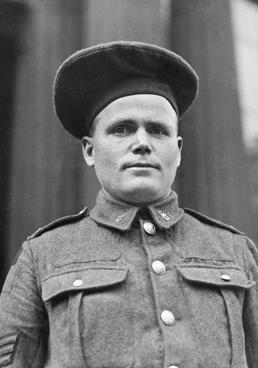 He was one of four Canadian soldiers to be awarded the VC on the first day of the Amiens Offensive, a pivotal assault that ultimately led to the end of the First World War. Sergeant Good survived the war and returned to his native New Brunswick, where he died in 1969 at the age of 80. The Canadian War Museum now holds 34 of the 96 Victoria Crosses awarded to Canadians. ‘Medals such as sergeant Good’s VC help us tell the story of Canada’s role in the First World War,’ said James Whitham, director general of the Canadian War Museum. On 8 August 1918, Sergeant Good, then a corporal, was part of the 13th Infantry Battalion, Canadian Expeditionary Force. His company pinned down by heavy fire and Good single-handedly attacked a German machine-gun nest, overwhelming the occupants and their three machine-guns. Later the same day, after encountering a German artillery battery, he led three men of his section successfully to capture the guns and their crews. The Victoria Cross medal is part of a collection of items belonging to Sergeant Good, including his khaki field jacket and regimental Balmoral cap, an inscribed gold watch awarded to him by the town of Bathurst, New Brunswick, and photographs of Herman Good and his brother, Ernest Robert Good, who was killed in action on the Somme in 1916 and is commemorated on the Vimy Memorial to the Missing. The medal was purchased with the assistance of the Museum’s National Collection Fund. The Fund is supported by donors who help the Canadian Museum of Civilization and the Canadian War Museum acquire important artifacts of Canada’s cultural and military history that might otherwise be purchased by private collectors or museums outside Canada. The Good VC will remain on display at the Museum until 5 January 2014. This entry was posted in News and tagged 13th Infantry Battalion, 1916, 1918, 8 August 1918, Amiens, Bathurst, Battle of Amiens 1918, Canadian Expeditionary Force, Canadian Museum of Civilization, Canadian War Museum, Centenary of World War I, Ernest Robert Good, France, Herman Good, New Brunswick, VC, Victoria Cross. Bookmark the permalink.